I had the great honor of being a guest in the talk show “Princess Diary” hosted by The Thai Princess Thun Kramom Ying Ubonrat. The show went on air on MCOT (Channel 9) late September 2010. 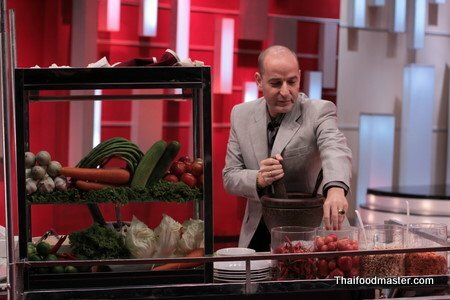 In the show I had the honor to prepare Thai papaya salad and offered it to the Princess to taste. Full Episode: “Thai Tee Rak” TV show. NBT2 channel.